Love the look of this set. Took awhile to put together but wasn't bad. Only wish the back of the furniture was a bit higher on your back. But it works. Create a glamorous and relaxing ambience with this 10-piece outdoor patio furniture set by BroyerK. This stunning, blue and grey set features three corner sofas, three middle sofas, three ottomans and a table that you can freely arrange in any configuration you want. Create one long sofa, an L-sofa or spread the pieces out to entertain and amaze. Seat height 15.7 inches with cushions, 11.8 inches without cushions. Assembly Required. This product will ship to you in Five (5) boxes. This set is very versatile and can be set up with many different layouts. The Grey (fairly thick plastic) Rattan is beautifully wrapped around strong and sturdy Aluminum framing. The aluminum is painted a silver/grey color, but is only showing on the bottom inside of each piece. I was concerned about the cushion color which ended up being a shade of grayish blue that looks better with different throw pillows than the cream colored ones that came with the set. The feet are made of silver PLASTIC and a small black plastic tipped balancing screw is assembled to help with any height adjustments that may be needed. This balancing screw also helps to protect the short plastic legs. It looked like the legs were Aluminum in the photos shown. Unfortunately they are NOT. The assembly was slow, but with a socket set to tighten bolts and a rachet screwdriver, it went together much faster. The table was the easiest to assemble, but took 2 people to lift the frosted glass top into place. It does not fit perfectly into the top at first, but once it warmed up in the sun, the plastic rattan had enough elasticity that the glass has settled nicely. The table once assembled is easy for one person to move. I wish there were more than 5 clips to attach the sections. 2 clips for each attached section is much more stable than 1 which is too wobbly. On the bright side, it came packaged very well. However, putting this together is extremely difficult and the instructions are pretty much useless. It was missing several bolts, and on the ottomans, the holes did not line up well. The table literally had one leg almost an inch shorter than the other three. I tried to get service for the table but was told Overstock no longer has parts for them. It's nicely priced and looks ok but very poor quality. So like the other reviews, this is a time consuming assembly process BUT totally worth it. I got this for a great price and it looks awesome on our porch-it is a purple grey type color but works for our porch. My husband is 6' 4' and it is a bit short for him but is perfect for everyone else in the family!! I would definitely recommend this for the money!! I ordered this in mid-August and it arrived right on time on the 22nd. I was out of town and so just put it together yesterday. There is a lot of assembly but my dad and I did it in just under 3 hours. The only way to get this together quickly is to have a cordless screwdriver with an allen head attachment. There were maybe two times we had trouble lining up the holes but otherwise all the pieces and hardware were there, including a few extras, it arrived well packed and it good condition and it is well made; the plastic woven rattan is nice and wide. The color is a brownish gray and the cushions are a blue gray. They're not super thick but they are in line with the price and they do zip off to wash. Even the throw pillows have a zipper, which is a plus. I didn't give this set 5 stars because it is on the small size. The backs are low and the seats aren't very deep or wide. The cushions on the ottomans slide off very easily; there is no way to attach them to the cushions. I might try rug tape to get them to stay on. Definitely worth the price. This set was a bit of a pain to assemble, but the worst part was when I assembled the table last, only to find out the glass top did not fit. I'm uncertain as to whether the issue is with the table or the glass and communicated that clearly to an Overstock representative. I received an email promptly that a replacement part would be sent out. The first time a replacement was sent out, I was tracking it, only to see that at some point it went missing, then was reported as damaged. The UPS tracking stated that the sender would be notified. After not hearing from Overstock, I reached out to them and was told that they would send another glass top. I stated that I thought that the problem may be with the table as well, not just with the glass top, with no response to my email. When my replacement piece came in, it was only the glass table top, shattered to just a pile of glass at the bottom of the box. This has become an extremely frustrating situation. After paying more than *** for this set, I expected more from this set. I'm still hoping overstock will rectify this situation and send a complete replacement for the table and glass top. I will say that the rest of the set looks nice assembled (cushions more grey then the navy blue that I thought), but without the table it's not complete. I absolutely love this patio set. It looks great when set up and is very comfortable. Takes a long time to set up but worth it in the end. Would recommend this to anyone who needs a large patio set. Perfect size for our patio. Table is narrow so it's not too overwhelming together with the sofa. Love the low back of the sofa because it doesn't block the view from indoors. A lot of pieces to put together but not hard. Came with the glass shattered but overstock replaced it. Comfortably fits 6 people but can squeeze 8. Great set for the price. The furniture was actually easy to put together! I assembled the whole thing within a few hours by myself. It is definitely is easier with two people, but doable with one. We love the fact that we got such a large piece of furniture for such a great price! Granted we have to buy a cover for the rattan when spring rolls around to prevent damage from the sun, which is a cost we weren't expecting, but not a deal breaker. We are very happy with this patio furniture and use Overstock again when we are ready for new indoor pieces. Assembly was not all that hard just time consuming. The sofa is so low to the ground and the backs don't come up high enough so you can't lean back. The pillow are not horrible but they are not fantastic either. Good set if you don't plan on getting really comfortable on it. It's just average. Positive note: it showed up almost a month before they originally said it would and all of the pieces were there! It has really pretty coloring. We got a great bargain on this patio furniture set. My husband grumbled as he put it together -- assembly was a pain -- but it's pretty solid and durable. I didn't care for the pillows that came with, so I swapped them our for brighter outdoor pillows to contrast with the subtle cushion color. We've gotten great use out of this set. My furniture arrived broken,still waiting on replacement very unsatisfied. The furniture is very comfortable and looks nice - the only reason I took away one start was because the cushions blown off in a light breeze, and there is no way to secure them down. Over all, though, I really like the set, especially for the price! Gorgeous and like other reviewers mentioned, difficult to assemble but worth the difficulty. I have purchased this brand in the past and have been happy with the finish of the rattan. This is a very nice set for the money and liked the colors. Love the versitily of this set! Sturdy, easily cleaned and comfortable. It accommodates our family of 5 and guests perfectly for fun summer dinners! It looks nice, but the fabric gets sun bleached by the sun very quickly. Was very happy with this furniture. I like that the table was high enough for eight people to sit and eat meals. The color is very nice. It did take a long time to assemble but it was worth it. 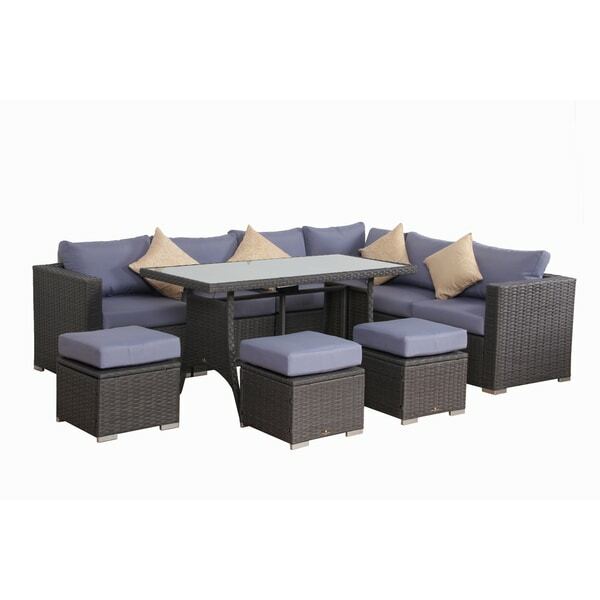 Great outdoor set, easy to put together and well made. The only negative thing I have to say is that the cushions have no way to be secured to the base/frame. The color is true to the description in other reviews, its a light periwinkle color. The size is perfect for smaller spaces when you want a lot of seating and versatility to change the arrangement. If you like the way this looks in the photos then you will be even more thrilled by the final product when you open it. The instructions were very easy to follow, the packaging and labeling were spot on. The seats are extremely durable and comfortable. Sooooo happy!! "I need new cushions for this set as the old ones faded and the internal cushions fell apart how do I buy them?" "Is it possible to get white cushions? " "Can you buy an additional armless chair (middle one) or two?" "What is the weight of the individual boxes shipped?" "The table looks high for the set almost like a high top or is it a coffee table"
The table is 28.8 inches high- and it is taller than a coffee table height, more of a dining table height. "What is the weight capacity for the chairs? " As detailed in the final item under the "Features" for this, the furniture set has a total weight capacity of 1,980 lbs (which calculates to about 300 lbs for each chair section and allowing for the ottomans to be deducted from the total weight). They are quite sturdy and one of the main reasons I purchased this set. "How thick and what material are the cushions?"